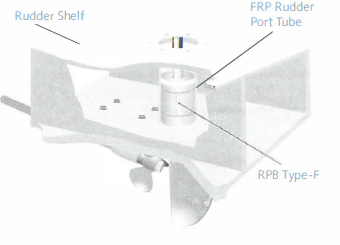 The following is a description of the installation procedures associated with the RPB Type-F. Installation instructions are included with each unit and should be followed closely. Prepare the rudder tube for bonding by wiping the inside clean of any dust or construction debris. Using a medium bodied epoxy or Chockfast®, coat the outside of the bearing unit that will be pressed into the tube. Lay a bead of marine sealant (such as Lifecaulk or 3-M 101) under the flange. Insert the unit into the tube. Temporary support may be required to keep the unit in position. Install rudder or dummy shaft to insure good bearing alignment until cured. Note: Before installing the rudder, insert the red installation hat into the lip seal. When rudder is in place, remove, invert and replace it on top of the Type-F unit to keep debris off the lip seal during use.